Since my stuffed zucchini recipe, I intently assess every vegetable with hopes of eventually stuffing it. 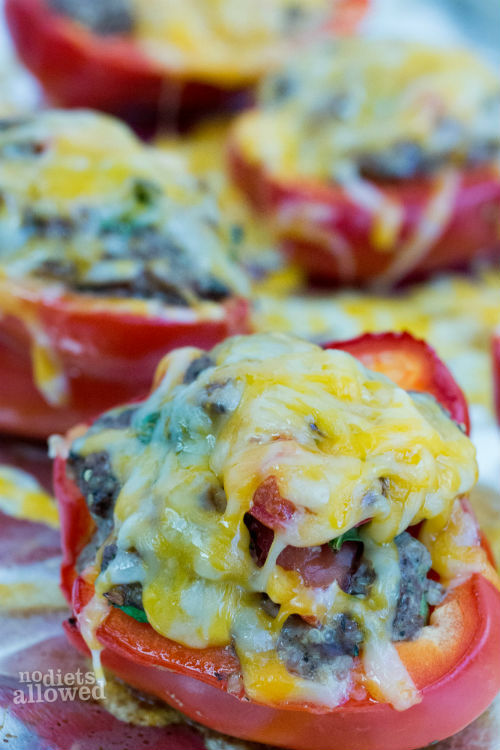 Veggies stuffed with other veggies smothered with cheese. Sign me up! Bell peppers obviously beg to be stuffed since they form a little bowl once hollowed out. Now… let’s go stuff these bad boys with some good stuff. My husband is not exaaaaactly a quinoa enthusiast. Shame. However, I always get a little burst of excitement when he doesn’t like something. It’s like an intense game of chess where I move one ingredient here and another there and before you know it… checkmate! 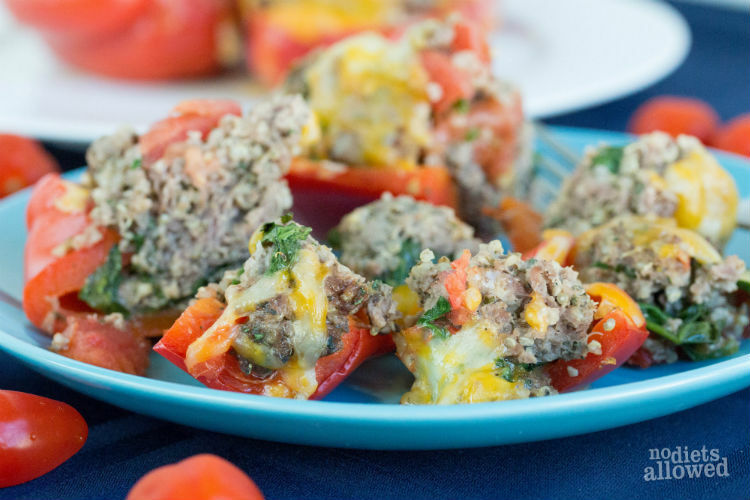 He’s falling in love with something he previously hated like these sneaky quinoa scrumptious stuffed peppers. Why did I use a chess analogy? I’m seriously horrible, and he always beats me. I’m way too competitive to admit my subpar chess abilities to him…. so let’s just keep this between you and me. For my fellow quinoa admirers, do not pass go, do not collect $200, and go directly to my balsamic quinoa salad! Now that it’s finally warming up (I kid you not… we had a foot of snow dumped two weeks ago), you’ll want to whip up this recipe the first time you fire up the grill for the season. Okay… chess? Monopoly? I’m getting way off track. Peppers, Kami. 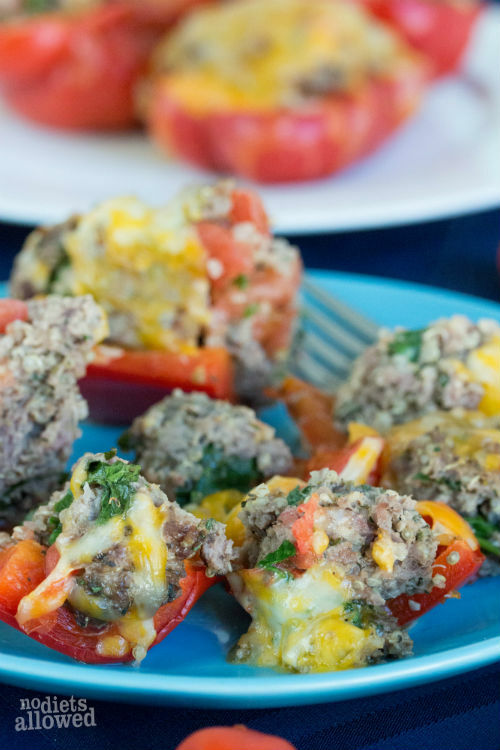 Talk about the amazingly delicious stuffed bell peppers! Okay, just a couple parting tips before you get to the recipe. Depending on how large and how much you stuff your peppers, you may need to adjust the baking time. You only need to bake long enough until the ground beef or turkey is thoroughly cooked. Also, the cheese, of course, is optional. The peppers are plenty tasty on their own without cheese. It’s obviously more healthy cheese-less too. For easier clean up, line your baking sheet with aluminum foil and just toss the foil when you’re done baking. Well, I think that’s about it! Here are some of the ingredients I use for making my quinoa stuffed bell peppers. Rinse quinoa well through a fine strainer. In a small pot, bring 1/2 cup water to boil and add quinoa. Cover and reduce heat to low. Simmer for about 15 minutes or until tender. In a medium-sized skillet over medium heat, add olive oil and heat for 2 minutes. Add garlic and onion and cook for 2 to 3 minutes until onion slightly translucent. Remove from heat. In large bowl, add onion mixture, thawed ground beef/turkey, tomatoes, spinach, jalapeno, oregano, basil, parsley, salt, and pepper. Mix well. Once quinoa is cooked, transfer to meat mixture and mix well again until well blended. On a large baking sheet, spray lightly with cooking spray. Line the bell peppers with hollowed middles facing up. 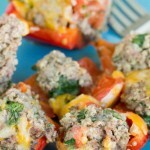 Scoop about 1/2 cup of meat mixture into each bell peppers center. Add more as needed. Bake at 375 for 35 to 45 minutes or until ground beef/turkey is completely cooked. 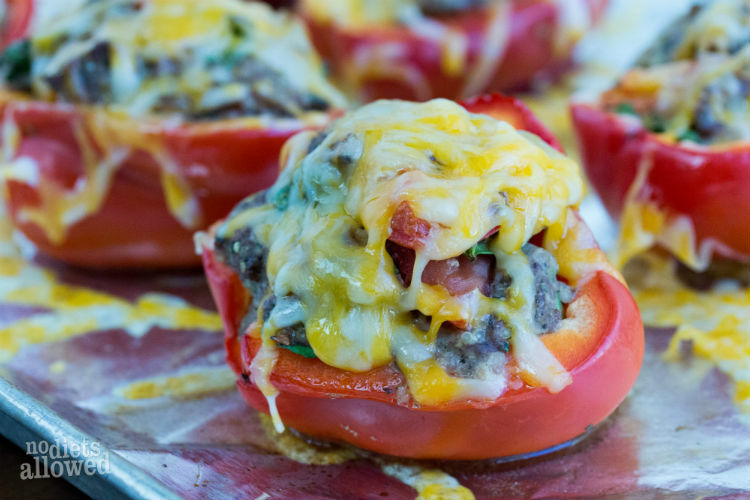 With 5 minutes remaining in cooking time, sprinkle with cheese and serve! I really liked these. How could you get the peppers softer? My mom Microwaves hers but I don’t think that would work with the tomato and spinach. Or did I just not cook it right? As always, great question Christina! You can always blanch the bell peppers prior to stuffing and baking. I like mine more crunchy, so I usually omit blanching them.